Trademark Series: Can a Geographical Name be a Trademark? Let’s take an example. Is the word PARIS registrable as a trademark in Canada? A quick search of the registry shows that there are over 250 registered marks which contain the word PARIS for everything from jewelry to software to real estate management services. A geographical name can be registrable. It depends. The issue is whether the word is “clearly descriptive or deceptively misdescriptive” in the English or French languages of the place of origin of the goods or services. In MC Imports Inc. v. AFOD Ltd., a 2016 case Federal Court of Appeal decision, the court reviewed a challenge to the registered mark LINGAYEN in association with fish sauce and shrimp paste products. The owner of the LINGAYEN mark had sued a competitor for infringement; the competitor sold shrimp paste under a different brand, but the packaging included the phrase “Lingayen Style” to describe its product. This reference to “Lingayen” was, according to the claim, an infringement of the LINGAYEN registered mark. Lingayen is a municipality in the Philippines known for its distinctive shrimp paste products. Thus, the court found that the use of the phrase “Lingayen Style” was not use of the word for trademark purposes, but was used to describe the place of origin of the goods with which it is associated. Therefore, there was no infringement. When considering a geographical trademark, ensure that you seek experienced counsel. Sure, Barbie is famous… but not “trump-card” famous. That was the conclusion of the court in Mattel, Inc v 3894207 Canada Inc., when Mattel raised a challenged that the mark BARBIE used in connection with “restaurant services” would lead consumers to make an inference that the restaurant was affiliated with Mattel’s famous BARBIE doll mark. Canadian Courts will not automatically presume that there will be confusion just because one mark is famous. As the Federal Court in Mattel phrased it, “the fame of the mark could not act as a marketing trump card such that the other factors are thereby obliterated.” Canadian courts will assess all of the surrounding circumstances to determine confusion. In Mattel, they considered the restaurant services to be distinguishable from Mattel’s famous doll. The owner of the famous luxury brand VEUVE CLICQUOT encountered similar difficulties in its infringement claim against a purveyor of “mid-priced women’s wear” being sold under the brand CLIQUOT in Quebec. In Veuve Clicquot Ponsardin v Boutiques Cliquot Ltée., Veuve Clicquot argued that the association with – sniff – mid-priced apparel was damaging its carefully managed reputation. In an interesting turn of phrase from the decision, the Supreme Court of Canada noted that the champagne maker “has been building its fine reputation with the drinking classes since before the French Revolution.” The role of champagne “drinking classes” as a catalyst for the French Revolution is perhaps a topic for a separate article. In any event, the Court did not find any evidence that the VEUVE CLICQUOT brand image was tarnished, or that the goodwill was otherwise devalued or diluted. The infringement claim was dismissed, leaving the CLIQUOT women’s wear shops free to continue business. Put another way, a mark can be so well-known to consumers that small differences in a competing mark will enable consumers to distinguish between the two marks. Get advice on trade-mark protection and infringement from Field Law’s experienced trademark team. Trademark Series: What is “use” of a trademark? This is a story of what “use” really means. In the internet context, a trademark can be displayed on a website by a Canadian company, and that website can be accessed anywhere in the world. Similarly, a foreign company can display its mark on a website which can be accessed by Canadian consumers. Is the foreign company’s mark being “used” in Canada for trademark purposes, merely by being displayed online to Canadian consumers? Non-Canadian trademark owners should take note: merely displaying a mark in Canada via the internet may not be enough for “use” of that mark in Canada. The services or products which are listed in the registration must be available in Canada. Make sure you get experienced advice regarding registration of marks in Canada. Most of us have had to pass through a CAPTCHA screen in order to log in or use a web-based service. This often involves deciphering and typing in one or two garbled words. 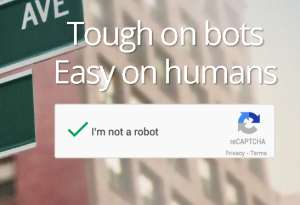 One of the more popular screens is operated by Google and known as reCAPTCHA. When Google recruits your human brain to decode text in the reCAPTCHA screen, it is doing two things: it is providing a service that protects websites from bots, automated spam and abuse, “while letting real people pass through with ease.” Second, it is deciphering text that stumps OCR technology, all the while teaching its own robots, through machine learning, to improve their predictive analysis of human text. (We can have a philosophical discussion about how being “tough on bots” is actually teaching the bots to read like humans… but that’s a topic for another day). Put another way, “Google is ‘crowd sourcing’ the transcription of words that a computer cannot decipher.” In a fascinating decision (GABRIELA ROJAS-LOZANO, v. GOOGLE, INC.), a California court has dismissed a class action claim that users deserved some compensation for the service they were providing to Google. To paraphrase, the lawsuit alleged that Google failed to disclose that the second reCAPTCHA word was used for transcription services (from which Google profits) rather than for website security purposes. However, according to the judge, profit by Google does not translate into a loss for the user who performs this micro-task, which takes each user only a few seconds. Plaintiff could not cite any case that supports the theory that a non-employee transcribing a single word is owed compensation. Since this is such a small amount of time, and there was no loss, damages or reliance on the part of the user, and no actionable misrepresentation or unjust enrichment on the part of Google, the court concluded that the class action should be dismissed. As reviewed in Part 1, since July 1, 2014, Canada’s Anti-Spam Law (or CASL) has been in effect, and the software-related provisions have been in force since January 15, 2015. In January, 2016, the Canadian Radio-television and Telecommunications Commission (CRTC) executed a search warrant at business locations in Ontario in the course of an ongoing investigation relating to the installation of malicious software (malware) (See: CRTC executes warrant in malicious malware investigation). The allegations also involve alteration of transmission data (such as an email’s address, date, time, origin) contrary to CASL. This represents one of the first enforcement actions under the computer-program provisions of CASL. The first publicized case came in December, 2015, when the CRTC announced that it took down a “command-and-control server” located in Toronto as part of a coordinated international effort, working together with Federal Bureau of Investigation, Europol, Interpol, and the RCMP. This is perhaps the closest the CRTC gets to international criminal drama. (See: CRTC serves its first-ever warrant under CASL in botnet takedown). Given the proliferation of malware, two actions in the span of a year cannot be described as aggressive enforcement, but it is very likely that this represents the visible tip of the iceberg of ongoing investigations.